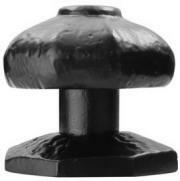 Foxcote Foundries black iron antique finish mortice ball door knobs. 42.5mm knob diameter on 55mm back rose, 62mm projection. Foxcote Foundries black iron antique finish mortice oval door knobs. 65.5mm x 32.5mm knob diameter on 55mm back rose, 62mm projection. 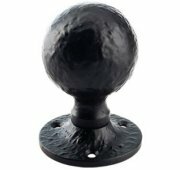 Ludlow Foundries black iron antique finish mortice ball door knobs. 45mm knob diameter on 60mm back rose, 67mm projection. Ludlow Foundries black iron antique finish mortice oval door knobs. 64mm x 36mm knob diameter on 60mm back rose. 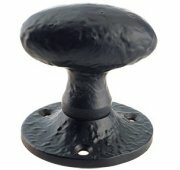 Ludlow Foundries black iron antique finish centre door pull knob, supplied with fixings. Size 2 ½ inch 64mm diameter, projection 60mm.